I made this quilt for my new niece Alexis. It looks huge compared to her tininess…but it’s a nice big size she can grow into a bit. I used the 60 degree ruler by Creative Grids, and started with 6″ strips and scraps. In all honestly I don’t love sewing with triangles…but I always love the result! 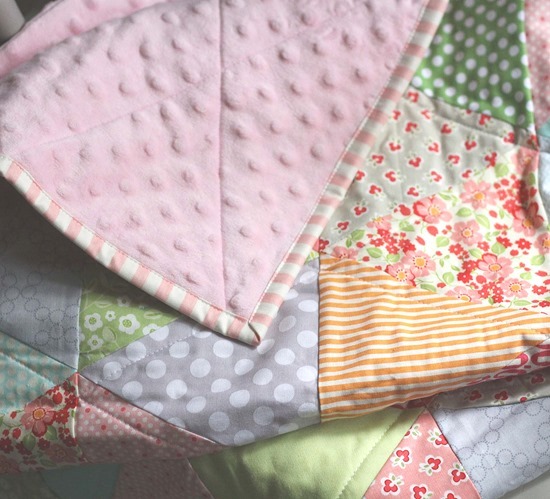 I love adding a really soft backing to baby quilts with a light batting that keeps the quilt warm but not stiff. I used a little bit of basting spray and pins, then minimally quilted some lines 1/2″ away from the seams. My 3 year old helped me get photos of this quilt. His cute little arms could barely hold the quilt up for one second before it got too heavy. So if you’re in need of a quilt-holder-upper… I’ve got the 3 year old for you…and I’m happy to lend him out. Triangle quilts are so pretty. I really need to make one. Your triangle quilt is so pretty. What a pretty quilt, I really like the colors. Very pretty! And I'm happy to see you had much better weather at the tulip festival than we did a few weeks ago. Adore! And I love the color/fabric combinations! I am super excited, I just bought your suburbs pattern! Gorgeous quilt! Too difficult for me to make though. Love the quilt, but I'm really amazed at the tulips! Mine are just up through the ground and I was thinking how great that was!! That field is in full bloom. What can I say, I live in Nova Scotia, the weather is very slowly warming up. It's beautiful – I love the soft colours, perfect for a little girl! I really must give triangles a go again because it does look amazing! The pic of your three yo with tongue out and captin underneath gave me such a huge smile! Oh man, that quilt is so gorgeous! I would love to sew one of these, but I'm intimidated by the piecing and cutting. I still don't understand how you manage to work with minky on the back! The baby you made this for is a lucky girl! so pretty! I have my own lovely 3 yr old yo wrangle, thanks! I'm presently using your hourglass tute to make a baby quilt and its coming together great! thanks for that! Your quilt is beautiful. I love your son's expression in the picture. He looks like a stinker! I love your quilt! Quilting is on my to do list, it is a little intimidating. I would like to make a great big queen size but I will probably start with a baby quilt. Your blog is on my list of blogs, so I can keep getting inspired! Very very sweet. Your scraps are pretty together. 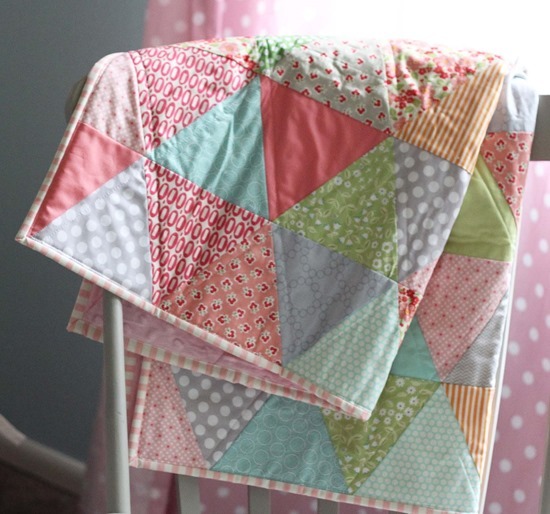 Love the triangle quilt–well worth the effort! Your gallery of finished quilts blew me away. Quite a body of work for one so young. It's absolutely beautiful. I would love to try backing with minky, but I'm so nervous to. That is the best picture I have seen of a 3 yr old in a long time! 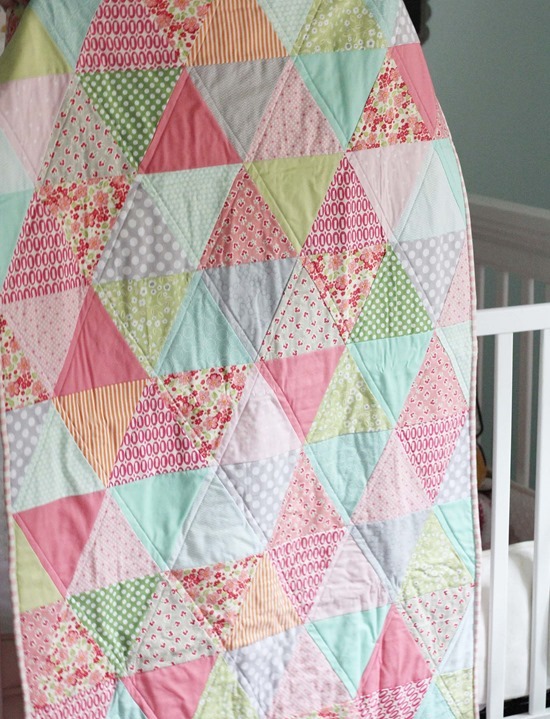 Love this baby quilt! Pinks are great. I still haven't dared use minkee. THREE? 3? How can that be? Seriously…. it hasn't been that long has it. Wow, I didn't realize I had been following your blog that long already. But then the fact that we have been here in Indiana for 3 years still surprises me too. Love this quilt! In fact this afternoon once I am done "clearing" out my blog reader I am pulling out my sewing machine and doing some crazy quilting. Just sewing pieces together in whatever order I pick them up. It will be a spring throw for our bed (thankfully all the "scraps" coordinate nicely! )… a light little something for when we need a bit more over our feet. Love, love, love it! The color combo of aqua, grey, coral and green is so pretty and sweet and fresh! Your 3 year old sounds like my 3 year old!!! Exhausting! Your finished quilts page just blew me away. Your work awes me with its creativity and beauty. When do you find the time to do all that sewing !~! This is beautiful! I love those fabrics, and the binding is perfect. Your quit looks so lovely and fresh in those colours. I love snuggly backings on quilts too. I'm sure she'll love it. I love the look of your quilt and I really want to make one for myself. Your helper is cute too. :-). Thanks for sharing. Great idea with the minky on the back might have to try this. Beautiful quilt- love the colors! Your little guys are adorable!! I really need to try and make one of these! Thanks for sharing! Such great colors!!! Simply beautiful!!! I just love this, so pretty! I want to make a triangle quilt so bad, I'm worried about piecing properly. Guess I need to look for some tutorials and just tackle one..
Beautiful quilt and beautiful tulips! I had to check your "About" page, because the scenery in the tulip picture seemed so familiar. No wonder, I drove through that area today on my way back home to Canada! My family and I went to the zoo just south of Everett – very nice! Was the picture taken in Skagit Co, WA? It's gorgeous, and all your triangle points line up! Do you have any top tips for triangles or is it just practice? It's beautiful – what a lucky niece! I had a chuckle when I read your comments about your 3 year old – so funny! The quilt is beautiful! A dear friend of mine is going through a difficult divorce at the moment so I'm making her a quilt for her new life and what pattern has she chosen – triangles!!!! Wish me luck!!! this is one of my favorite posts of yours. you cover what you enjoyed about the quilt (the final product), what you didn't like (sewing triangles), and a little piece about your three-year-old to make the post more personal. it was a really sweet combination. i loved the photo at the end – the flowers make a great backdrop! Nicely done! What type of batting exactly do you use for baby quilts. I made one and it turned out kinda stiff as I used my regular weight cotton batting. I'd love some advice! Super gorgeous! I'm making a triangle quilt right now and it's not my favorite to sew together, either! I hope you have a great Monday! A very sweet baby quilt. Looks soft and cozy. What type of light batting did you use? Love the look of your quilts age too. Is it hard to create the grid look of all the pictures? I really like it. Allison…. did you use batting in this one or just the minky backing? You drive me nuts cause every time I think I have found the next quilt pattern for my Natey… you then post something adorable that makes me second guess myself…. blah! love the triangles and such pretty colors! I love quilts with soft backs, my kids won't touch ones without. And those tulips!!! seriously, send them my way. I laughed so hard I had tears in my eyes. The quilt is beautiful, the photo is priceless (our just turned 4 & 5 so I'm right there with you). We've been buried under snow & more snow in MN. Your photos bring a sense of joy. Your quilts & blog are my inspiration for my venture into quilting. I've learned so much from your posts. Thank you! Your little guy looks like he keeps you on your toes, such a cute family. And the tulips! Are you in Washington? I thought the tulip fields looked familiar….I live in Kirkland, wa…Glad to know you live fairly close! Love your latest quilt…You inspired my first ever baby quilt…and now a second one. Thanks so much for all the sharing you do. I visit daily… I raised 2 very active boys….I am pretty sure I get how busy you are! Totoally gorgeous! I love this one! You always choose the best fabric combinations! Adorable kids too! The quilt is so sweet. Just love the face in the photo! Simply beautiful, like everything you do! I love the quilt and I love your pics with the tulips! Such a pretty quilt!! And I love your quilt photo helper: so cute!! And I love your comments about him: LOL!! Mine are too old to make noise in church (phew!!) I made a triangle quilt for my nephew about 3 yrs ago and seeing this one reminded me of it. 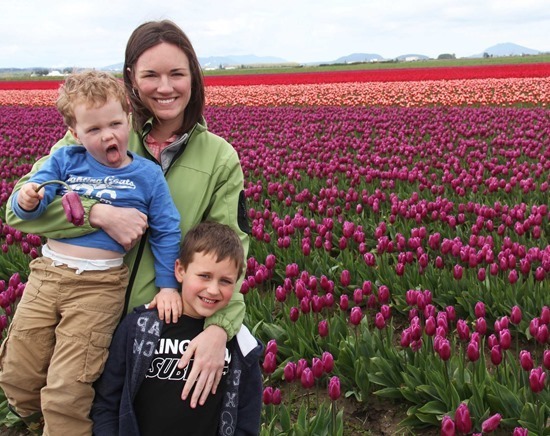 I forgot to add: thanks for sharing your photo with the tulips: so pretty, and I love that you and the boys are in it. Seeing your triangle quilt for your niece reminded me of the one I made> Have a great week!! 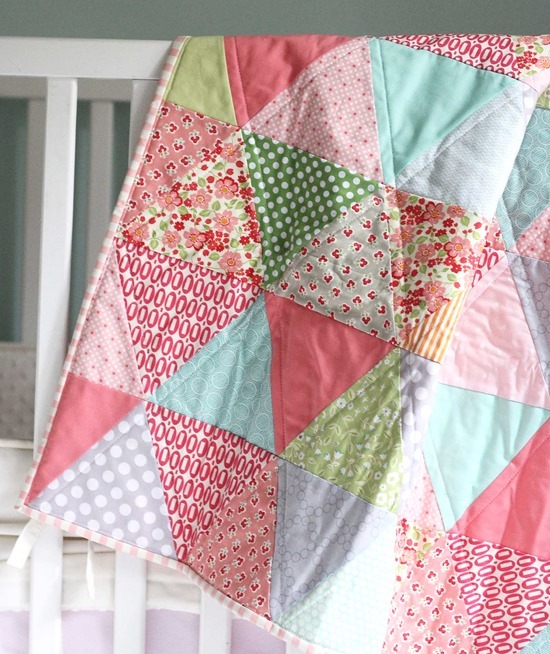 Beautiful quilt, I love triangles but haven't attempted them yet! The quilt is very pretty. So your three year old is the one being a dork in the pic? Sounds like a typical boy with typical dislikes, sitting still, being quiet! Bring on preschool! I know where you are at the bottom picture…..LaConner. I miss living in the NW around the tulip festival season. When you joined your triangles, did you press the seams to one side before you added the next triangle? Hi Linda! No I didn't press after adding each triangle…I sewed the triangles into rows and then pressed. What do you recommend for a “light batting” in this quilt? And also, do you recall the approximate finished size?